We’re absolutely delighted to share with you our Fresh Chocolate Milk in collaboration with Pump Street Chocolate. After meeting Joanna, Chris and Rob of Pump Street over a year ago we set about to create the most delicious Fresh Chocolate Milk. We wanted to create a product that showcased the work from the farmers we’ve both worked directly with for years and whose produce and craft make up the two core ingredients in our chocolate milk. The sustainably sourced free-range milk from our farms paired with 100% Ecuadorian naturally processed cocoa powder yields a rich and unique flavour profile, which showcases the full characteristics of both the dairy and the chocolate. Following this pairing we add a small amount of sugar for a balance of sweetness and that’s it! No stabilisers, additives, or ultra heat treatment - just 3 simple natural ingredients. Award-winning Pump Street Bakery is a small, family owned bakery and café in the village of Orford, on Suffolk’s heritage cost. They pride themselves in offering outstanding bread and handmade pastries. Having mastered the art of bread and pastries, they have turned their all-consuming focus on quality to chocolate. Along with only a few other British producers, they are making small-batch chocolate from beans imported directly from family farms and cooperatives around the world. 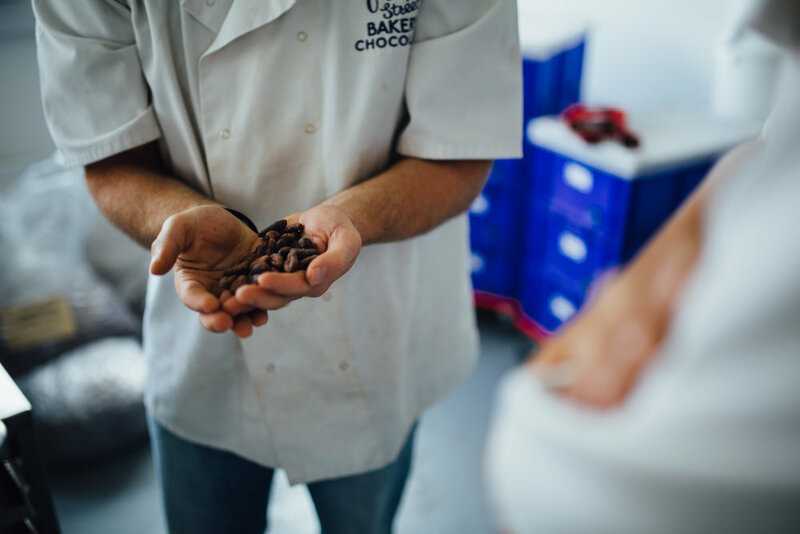 Upon arrival they hand select the beans and then carefully roast, winnow, grind and conch them for up to 5 days before maturing and tempering the chocolate into bars enjoyed across the globe. The first step of the process for our chocolate milk starts at Pump Street. Rob and his team sort and roast beans from Samuel von Rutte’s Hacienda Limon in Los Rios Province, Ecuador. They then undertake a process called breaking and winnowing which separates the husk from the heavy, pure inner bean, knows as the nibs. The cocoa nibs then go through a light stone grinding process, which takes around 4 hours before being transferred to special cocoa press. Pump Street are on the only UK producers to have a cocoa press in house which enables them to remove the majority of the cocoa butter and leave a naturally processed 100% Cocoa powder. The powder is then sieved through an incredibly small micron sieve before being packed and sent to our dairy in Bristol whilst the cocoa butter is then used for white chocolate bars. Once the powder arrives in Bristol we measure and weigh the specific ratio of chocolate and sugar before blending it with our milk collected from the farm on the day of production. The milk is blended under a light heat with the cocoa powder and then rapidly cooled before being sealed by hand and then it is ready for the shelves.